Hong Kong, 22 March 2019 – Following RETN’s unprecedented growth in the APAC region in 2018, RETN continues its push across Asia by opening up a new market – Taiwan, and expanding in its existing Japanese market. RETN’s new site in Taipei located at Chief LY data center provides access to the RETN global network and extensive service portfolio, comprising IP transit, Ethernet, Colocation. To provide Taiwanese companies with local billing and support options and to further facilitate business growth in the region, RETN is also establishing an entity in Taiwan. RETN has 3 new sites in Tokyo: Equinix TY4, @Tokyo CC1 and BB Tower. The new sites complement its existing point of presence at Equinix TY2. All sites are linked by a metro dark fiber ring, running an Infinera DWDM platform with an overlaid Juniper IP platform. RETN will be providing a full service portfolio on the Tokyo metro: IP transit, Capacity (N x 10/100G). Ethernet and Colocation. In addition to the new locations RETN will also be providing services via subsea cable into Eastern Russia and back to Europe, one of the shortest paths available today. This new link will complement existing links to the West Coast of the USA, and to Europe via RETN’s TransKZ terrestrial routes across China and Central Asia. RETN initiated its network in Asia in 2009, with its entry into the Hong Kong market. 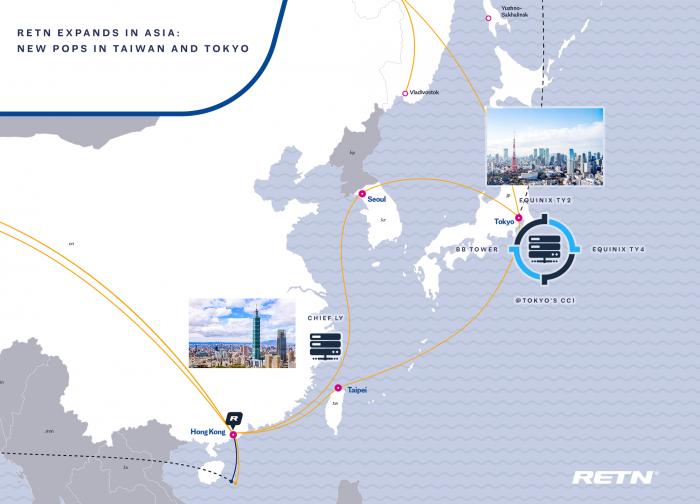 After the launch in 2016 of RETN’s exclusive TransKZ route connecting Hong Kong terrestrially with major European PoPs, the company has expanded its presence dramatically to 11 PoPs in 5 territories across the region. RETN is one of the fastest growing independent European providers of IP Transit and network services, now with a unique capability to connect Europe and Asia. It is the only provider that operates its own end to end network through Western Europe, Belarus, Ukraine, Russia, Kazakhstan and onwards to the Chinese border, and is offering differentiated terrestrial connectivity between these major markets. Through recent investments in its Asia Pacific operations, RETN can now deliver IP Transit, Ethernet&VPN services from Hong Kong, Seoul, Singapore, Taipei and Tokyo with industry leading delivery times, lower latency, leveraging deep technical expertise and providing better reliability than traditional terrestrial and subsea routes.